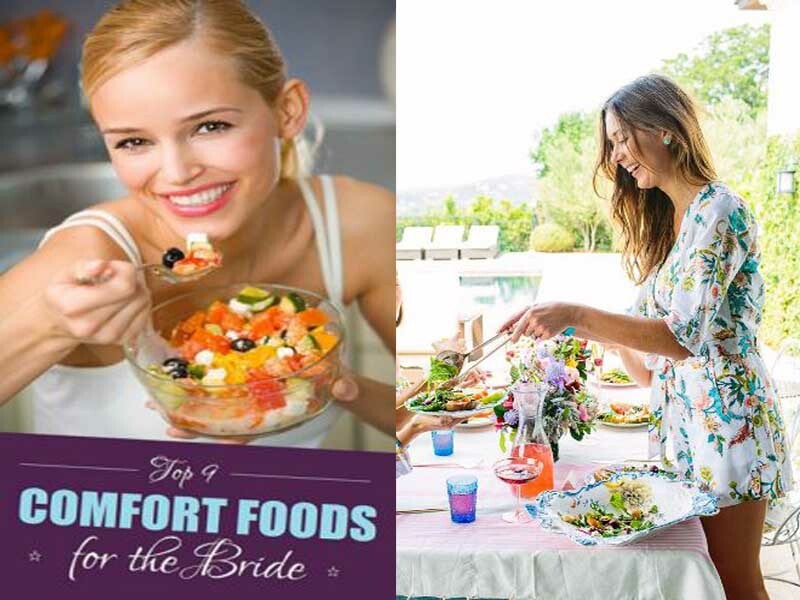 Couples think so much in the making and choosing the engagement rings for their special day. And why not! There is not one or two designs that is done with the variety of rings but a miracle of many designs that would surely make you confused in selecting your couples rings set. Beautiful heart matching rings or the mixed metal rings. The solitaire diamond rings or the incredible designer pave diamond set rings. The umpteen numbers of designs in the couple rings make you choose one and love another. In fact you cannot just select the engagement rings but also beautiful and different designs of wedding rings, and special occasion rings. 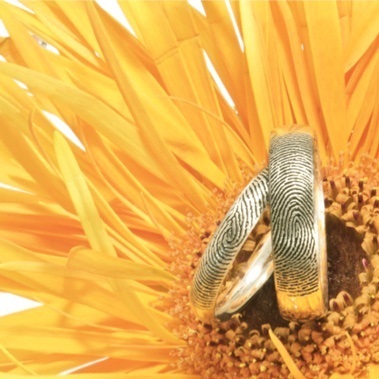 The engraved rings with names, heartbeats, sound waves of their name spell, the DNA shape rings or the initial rings. Couples largely choose matching rings to express their love for each other. Rather is a beautiful way to bring two hearts together not for only one day but for the life time. 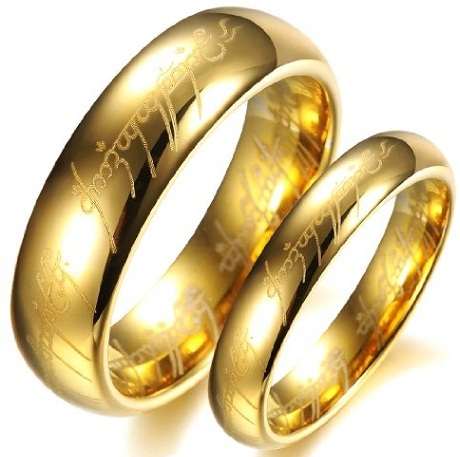 Here we share some latest pairing gold rings for couples with beautiful designs and names. 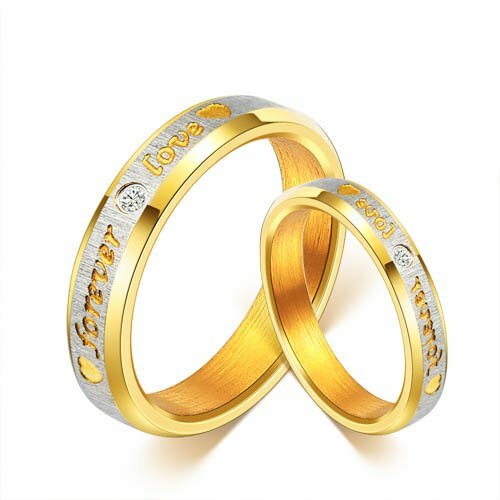 Couples rings in gold with the half hearts on each of the rings are old and very much admired design for the couples matching rings. The half hearts become one when brought together. A diamond in its smallest size glitters attractively from the rings. 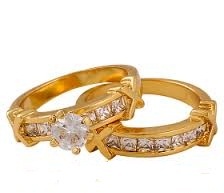 Matching couples rings gold alloyed always make a rich impact from the wearer’s fingers. A diamond studded in a beautiful design lined in a way that when both the rings are brought together they make a single design. 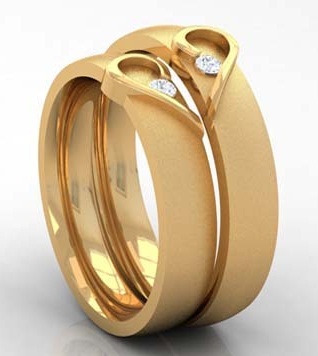 Two sides designed gold couples’ rings look amazingly fantastic. The inner side of the rings have cut and hollow design while the upper surface have smooth finishing and diamonds studded in them. The male and female rings fantastically looks paired yet defers from each other. 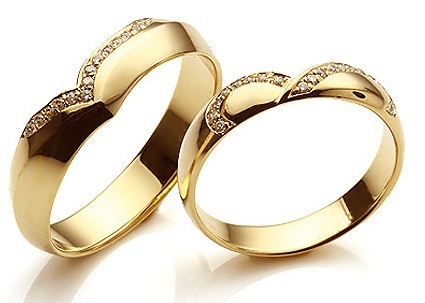 Impressive and astonishing titanium gold rings for couples also make a heart stopping impact. Beautiful rings with embossed type design on the upper surface of the rings with a dark shade looks incredible. 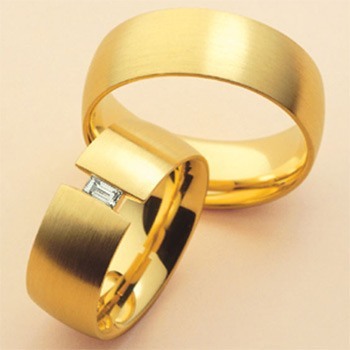 Couples gold rings designs are brought to a different level of personalized designs like the finger prints on the gold. People engrave deep impressions of their finger prints on gold and make promises beautifully to each other for living a life truthfully forever with each other like the finger prints on the promise rings. 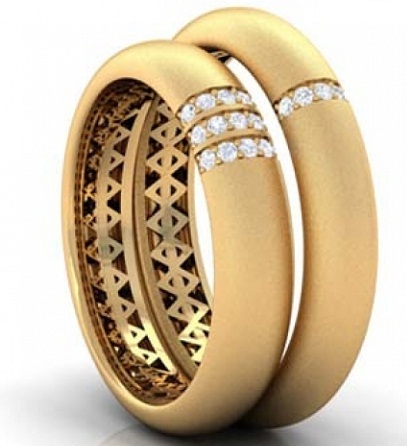 Incredible jaw dropping designs like the diamonds in gold couples rings designs also win many hearts. Couples in large generally choose diamond rings for their day of commitment. Beautifully stud princess cut diamonds set in the middle of the ring band looks exclusive. 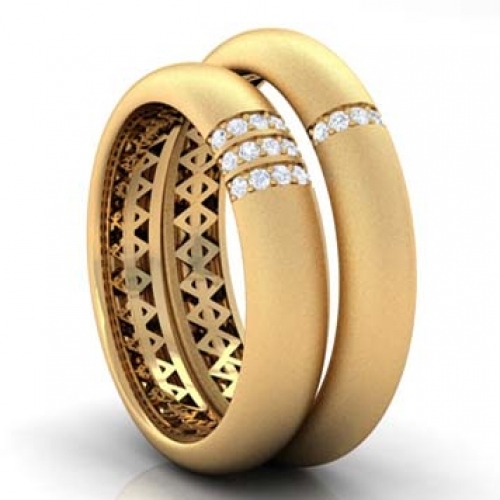 Gold couples rings designs with a chiseled new look can make your day glam up. 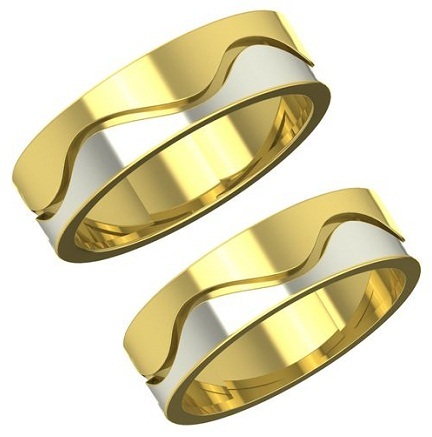 A wavy made out design from gold looks fantastic for the couples matching rings. The rings can be differed with one diamond studded and the males ring plain. 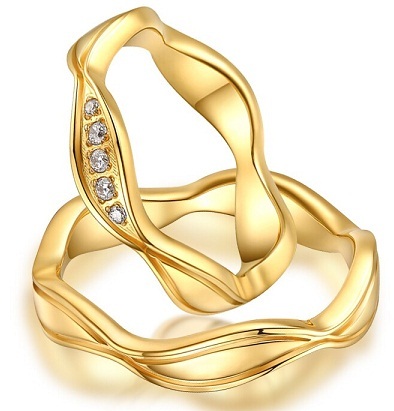 Broad ring bands couples rings designs in gold incredibly shine upon the hands of the couples. Clearly able to be seen from a distance the broad rings are polished in a smooth surface. 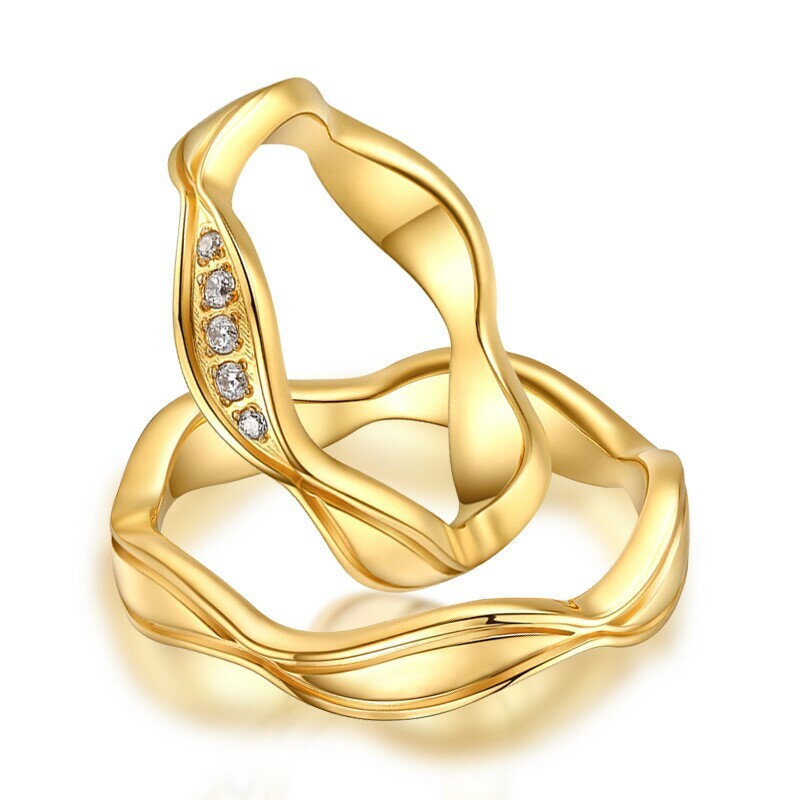 The male and female rings are differed with a single diamond stud in the center of the female ring. 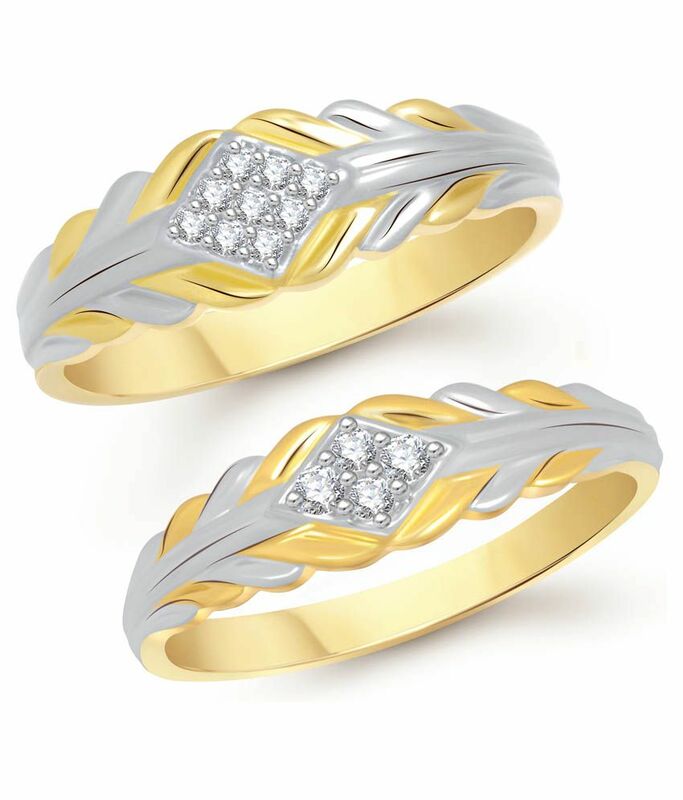 A crystalline glamour from the dull yet sparkling design made on the gold couples rings designs look splendiferous. 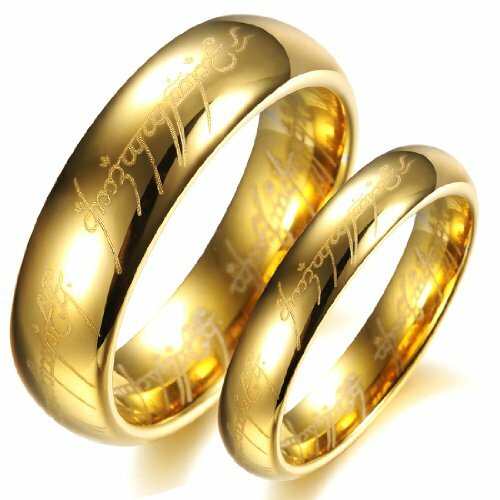 The shine of the rings gracefully looks great for the matching couple’s rings. The corners of the rings are plain and mirror shine polished. 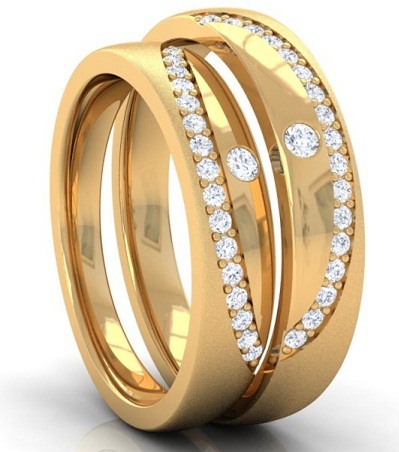 Gold rings for couples look spectacular even more when they are more simple and magnificent with no over designer aspects. The lady’s ring studded with diamonds lined up with paved diamonds, while the man’s ring is polished brushed shade. 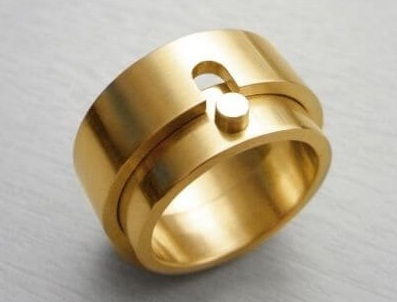 The couple’s rings designs in gold are so amazing with some peculiar shapes. The inner lock designs of paired couple’s rings are so romantic in the reason behind it. The girls ring has a knot in the center and the males ring has a space for the not to get place for it. 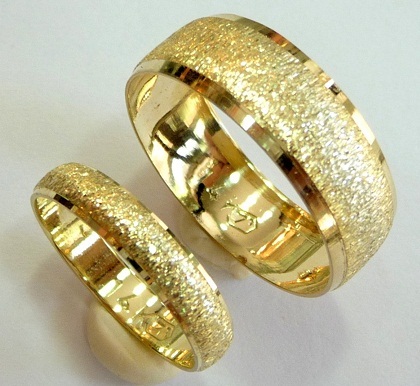 Dual gold couple rings look magnificent in the two tones in their making. 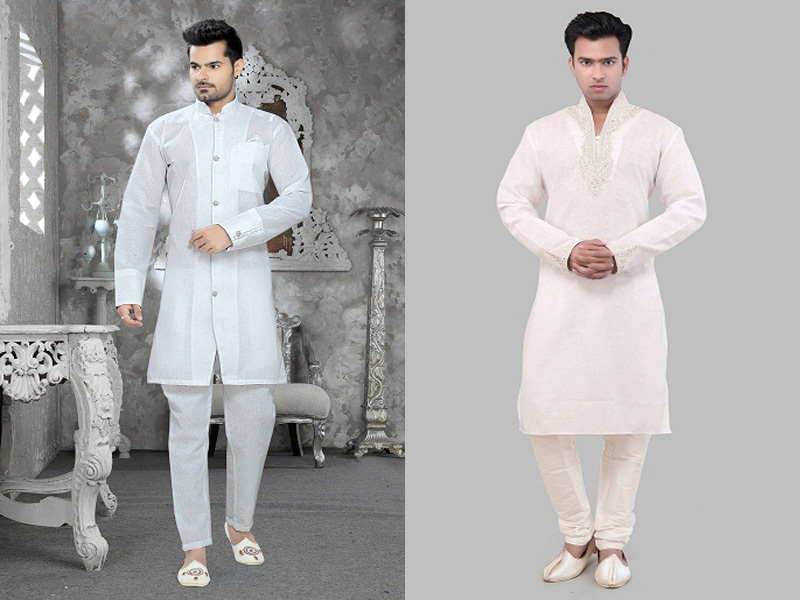 The white and yellow shades of the rings look spectacular and designer. The wavy line that separates the two colors of gold and silver highlights the design. 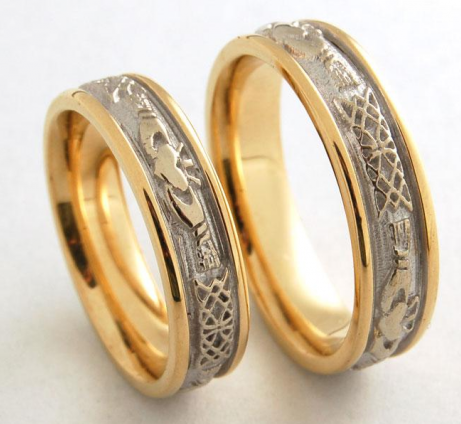 Gold couples rings with pattern made on the surface of the rings with a knot symbol looks brilliant. The pattern is decorated with deep brushed shade. The rings look amazingly similar to each other and suits perfectly on the couple’s hands. 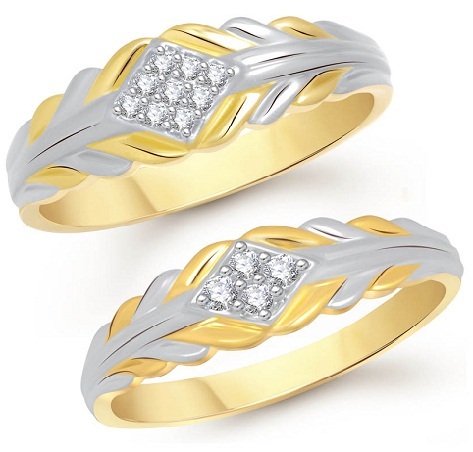 Gold couples rings designs with two tones with rhodium coating on them are fabulous designs people opt for their special memories. Diamond studded in the center and rhodium designs like the leaf nerves from them look incredible. 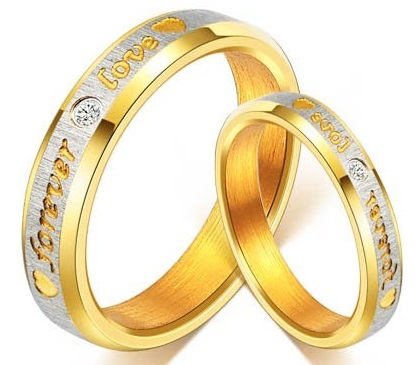 Couples ring designs in gold also are personalized with bible engraved on the top surface of the rings look great. Couples promising each other with presenting them promise rings engrave the bible promises on the rings. The holistic ideas of rings have won many hearts. 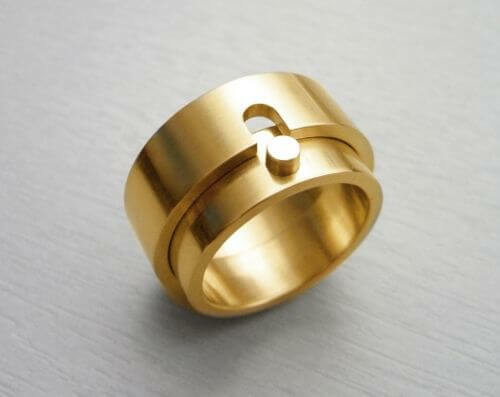 Apart from yellow gold there is rose gold, titanium gold and platinum gold and also tungsten gold that have becoming very famous in couple rings. Newly wedding couples love to make a memorable day with similar rings that set beautifully on their fingers. After all the ring finger which is the finger straight touching the heart vein, so the ring also should be full of love. Couples these days also love to make the rings that match with each other when brought together and form a particular design. Half hearts or the key and lock rings, the heart beats and the block heart beat each respective ring creates beautiful designs. How To Make Lip Balm?